Just imagine – in just ten minutes a day you could calm your mind, get rid of stress, get rid of negativity, make it easier to do what needs to be done to meet your needs and solve your problems. The Peaceful Place meditation technique in the book “Your Peaceful Place” which comes with two audio cd’s is a way that busy people can do all this and more. Your Peaceful Place is a special place you can create inside your mind, where you are always at peace and relaxed. A place you can get back to easily and in the process of getting there, you automatically relax and let go any stress and anxiety. Once you have practiced this simple meditation technique every day for a month,you can relax in three or even one minute. This is important because it means that, whenever you feel stressed, before a difficult meeting, before you go to the dentist, before studying, before doing exams, before a job interview, before you go on a date, you can go to your Peaceful Place just briefly, settle your mind and body and then any stressful occasion can be handled calmly. 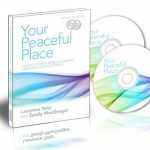 Your Peaceful Place, co- written by Laurence Toltz and veteran trainer Sandy MacGregor, describes Sandy’s easy to learn, easy to do, self-talk meditation technique for busy people, and isn’t everyone busy these days? The meditation technique can be learned from chapters one and two of the book and CD1 or just by listening to tracks one to four on CD1. 2. Less stressed people get on better with those around them, be they a partner, family or work mates. 3. Most people report going to their Peaceful Place just before or after they go to bed makes it easier to go to sleep. The major advantage of this meditation technique is that it is simple, people like it, they feel happy and relaxed while in their Peaceful Place. They can move from a stressed state to a peaceful one in minutes.A busy doctor who now uses the Peaceful Place System, comments that previously, after a day in the surgery, he was so stressed that when he got home he was too stressed to even play with his kids or help his wife until he went to his study and downed two scotches to help him relax. After a few weeks of going to his Peaceful Place for one to two minutes between patients, he now arrives home fresh and ready to play with his children and be a part of the family. STAGE TWO: Your Peaceful Place is also the place where by following a simple four step system, you make it easier to meet your needs, solve a wide range of problems and achieve your goals. Changing long established habits of thinking and behaviour is very difficult for most people. The Peaceful Place System helps people break through whatever is holding them back and motivates them to make the changes they need in their lives. Please visit the website yourpeacefulplace.com.au.On the home page, press the play button to listen to co-author Laurence Toltz being interviewed about YOUR PEACEFUL PLACE by Radio National’s Rachel Kohn, on her program The Spirit of Things. Questions and Answers about the book begin about 45 seconds into the interview. There is a link to Chapter One of Your Peaceful Place on the home page. The real plus for Judith was, that after practicing the Peaceful Place system for four weeks, Judith began to feel more in control and the overwhelmed feeling she had lived with for so many years lifted and she was able to prioritise and see key issues in her life more clearly and objectively.“You look at things differently after using the Peaceful Place process. I am more self aware and have had a breakthrough at work. Overall the process helped me get rid of the feelings of being ‘out of control’ and ‘overwhelmed’ and I now know I’m in control of my life instead of the other way around. Betty who had been ill, was six months down her healing journey when she discovered Sandy’s Peaceful Place system and how she could take control and make a huge impact on her recovery. “The techniques gave me the tools to help myself in all parts of my life. It is only now I have realized I don’t even think about going to my Peaceful Place, I automatically do it “I go to my Peaceful Place while waiting for appointments, prior to encountering new situations, making important telephone calls, to remain centred and be able to see situations as they are and not become caught up in the emotion of the event. I also go to my Peaceful Place prior to meditation, prayer and any activity requiring total concentration. I go there every chance I have to just sit, and every night before going to sleep. Now I do it automatically — it doesn’t seem to take much of my time but it has maximized my body’s natural healing energies and has had an enormous impact on my coping skills, energy levels and my health and well-being. It is a major factor in me being as well as I am today.